In Bangkok, you can kneel before an emerald Buddha, gaze at golden temple, shop for sparkling red rubies and deep blue sapphires, and dine on red, green or yellow curries. 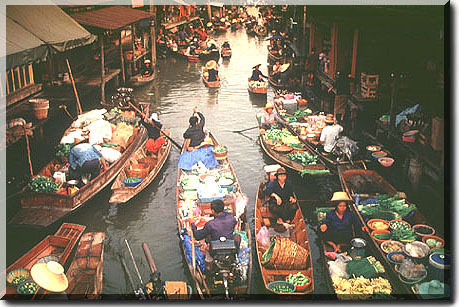 Along canals, known as klongs, women paddle their shallow boats and sell ivory-colored orchid leis and yellow plantains. A building is graced by a five-and-a-half ton, solid-gold Buddha, discovered purely by accident when plaster used to hide its value from thieves cracked and revealed the treasure inside. Beautiful and friendly, the Thai people bring new meaning to the word welcome. * Package prices are in US Dollars, per person, twin or double occupancy not including transpacific airfare. All rates are subject to availability. Restrictions apply. Accomodations may be substituted with hotels of equivalent categories without prior notice.